1) With the mesh selected, under the “Get” section of the Model/Animate/Render/Simulate Toolbar on the leftmost part of the program window, go Property > Texture Projection, and then pick an appropriate Projection Type. Note: The XZ Projection--aka top-down projection--is usually the best in most cases, but technically since it will be frozen anyway, it doesn’t really matter which one you pick. 2) Press Alt+7 to access the Texture Editor. 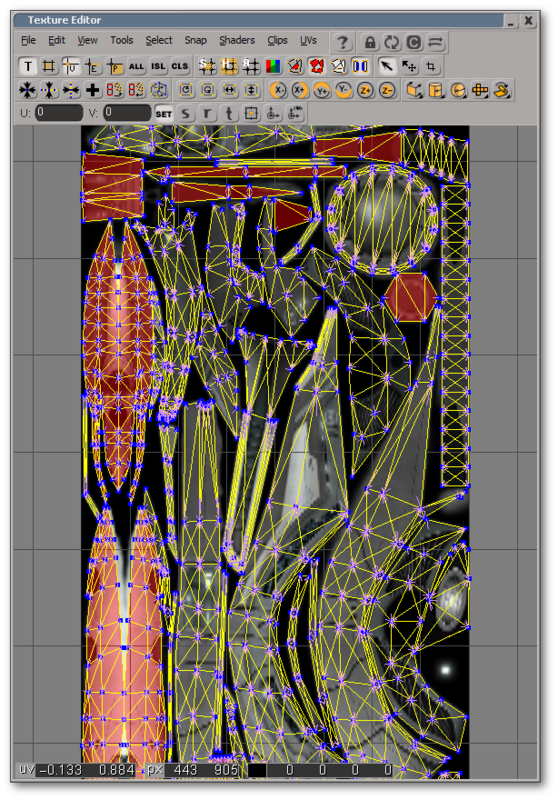 3) Edit the UVs as you see fit. 4) Freeze your model periodically to reduce the lag to your system. This page was last edited on 1 October 2016, at 00:05.